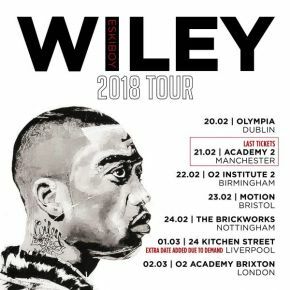 The Godfather of Grime, Wiley​, has announced his biggest ever headline show to date, at Brixton's O2 Academy on Friday 2nd March, unveiling a 6-date tour of the UK and Ireland, taking place across February 2018. The tour follows the huge success of his latest album ‘Godfather​’ and his historic showcase at Camden's Roundhouse. The Roundhouse show went near-viral, with a veritable roll call of grime royalty coming out in support the Godfather. BBK members Skepta, JME ​and Frisco took their turns, as did Devlin, Lethal B, P. Money ​and Ghetts, with Stormzy​ topping off the selection of surprise guests. Having spent much of 2017 garnering the biggest accolades in the industry, Wiley has been widely recognised by several of the biggest names and publications in music for his innovation, and has been the subject of widespread critical acclaim, with the ‘Godfather’ ​album serving as one of the most seminal productions of recent years. With his status reaffirmed as an innovator of the genre, his upcoming ‘Godfather II’ album builds on the success of the former, featuring the highly acclaimed single ‘Call The Shots’​; a cleverly lyricised tale of his rise to power. The production, boosted by bass-heavy chords and Wiley​’s typically sharp lyrics, has been widely praised since release, with collaborative artist JME providing candid bars which serve as the perfect counter-punch on the track. Following the release of his eagerly anticipated autobiography Eskiboy​, Wiley’s ‘Godfather’ tour will see the curator playing out many of his ‘Godfather II’​ tracks for the first time in a live environment. Don't miss Wiley​'s biggest ever headline show to date in the UK - tickets on sale now.